Geeks will go crazy over anything that can be remotely controlled. So I am fairly certain that this is up a geek’s alley. Today, we’ll be taking a look at the Egofly Hawkspy radio-controlled helicopter (LT-712) from Xenon Project which retails for $69.99. They also carry an entire line of remote control helicopters which is worth a look. What sets the Hawkspy apart from other RC helicopters is the addition of an onboard camera that can be triggered from the transmitter. I have to be honest here, I haven’t reviewed many RC helicopters — none, in fact. But if you’ll bear with me, I’ll try my best to go over the Hawkspy. We’ll also be giving this review unit away to a MakeUseOf reader so be sure to join the giveaway and be in the running to win it. For $70, you’ll get the Hawkspy, its remote control (transmitter), a 1GB MicroSD card, a (very bright orange) MicroSD card reader, a spare tail blade, 4 landing skid rubbers, a wall charger and the user manual. The first I did was throw away the user manual — it was most probably written and printed in China and therefore extremely confusing. I learnt more about flying an RC helicopter by browsing on YouTube for instructional videos. There was however, one important fact about the Hawkspy that did come through the user manual — it shouldn’t be charged any longer than an hour to 75 minutes. That was about it. The helicopter unit is smaller than I had anticipated; measuring at 12.5 inches, which is roughly the distance from the elbow to the tip of the middle finger on an average human. It’s also extremely light, being made out of mostly plastic trim and an aluminium frame. The main attraction of the Hawkspy is most definitely its onboard “spy” camera which is mounted at the bottom of the unit. The fixed forward-facing camera is activated by a button on the transmitter and once enabled, it records video only at a resolution of 720×480 in MJPEG format directly into the MicroSD card. Where the MicroSD card slots into the camera unit is pictured below. There’s also an LED light to indicate when recording is in progress. Although the camera isn’t capable of recording in high definition, I found the quality of the video to be acceptable even in low light conditions. There are quite a lot of videos recorded by the Hawkspy on YouTube so I won’t bore you with any of my test footages. The only thing that’s missing from the entire setup is a way to remotely view the captured video without actually having to remove the MicroSD card and inserting it into the reader. It would have been nice to actually see what’s being recorded in real-time. But then again, for a $70 toy, that is probably asking too much. Now, operation. The mode-2-ish transmitter requires a whopping 6 AA batteries to operate. The retractable antenna is able to control the helicopter up to 90 meters away. On the left, you’ll find the throttle control (makes the helicopter fly higher or lower). The rudder and the forward/backwards flying directions are controlled on the right. The power slider is smack right in the middle, which an LED indicator right above it. RC helicopter hobbyists will probably point out that the cyclic controls are sort of inadequate — the right/left cyclic controls are missing so the helicopter isn’t able to pitch to the left or right. There is also an additional slider below each control toggle. The one of the right is the ST trim slider, which needs to be adjusted if the helicopter spins to the right or left on its own while in the air. Unfortunately, the slider on the left is a dud and the transmitter is missing throttle and pitch trims. The two additional buttons on the left and right of the power slider controls the landing and rudder LED lights on the helicopter and the 2-speed mode (which didn’t make any difference during testing) respectively. On a full charge, the Egofly Hawkspy provides you with 10-15 minutes of flying fun. The included 1GB MicroSD card is more than sufficient to record your entire flight session. The Hawkspy is a novelty toy with the added capability of recording video. It’s certainly a fun toy to have around. It’s small, light and pretty durable. If the flight time could be improved, I’d easily recommend it. We’re giving one away this week! 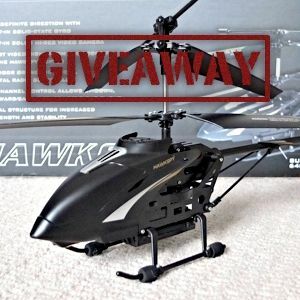 Join the giveaway below to be in the running to win a free Egofly Hawkspy. The giveaway is over. Congratulations, Dave Lunley! We’ve sent you an email, please reply it before May 18. Enquires beyond this date will not be entertained, and a new winner will be selected. This giveaway begins now and ends Friday, May 11th. The winner will be selected at random and informed via email. I have this helicopter. I paid about $85 for mine online. There is a little mall booth at my local shopping mall that sells RC helicopters and for this one, they wanted $199. I liked it, and watched the booth operator fly it all around the three story hub of the mall, but I told my wife, "I'll bet it is much cheaper online" and boy was I right. This being my first RC helicopter, I crashed it a lot. At first I only flew it in my large, sparsely furnished living room, but eventually the time came to try it outside. The only large open space outside is in the street in front of my house. One day, the weather was nice, so I took it out to give it a try. Within five minutes, I had crashed it hard enough to break a rotor blade. The new brackets just came in and the helicopter is whole again. I am waiting for it to charge before giving it another try. My advice to anyone who thinks this would be a good starter RC helicopter is to think again. It is big enough to break badly when crashed and it doesn't come with any replacement parts, except for the tail-rotor which isn't an actual tail rotor. My original tail rotor is still pristine. If you buy this helicopter, you need to have extra rotor blades, and the little parts that connect them to the main drive shaft. This Helicopter with spy camera is amazing, even when I've seen the quality of the videos is not as good as I'd like, its a great toy, it still is an RC Helicopter, a little small for my taste because I like larger RC Helicopters, like a 3.5 Channel Gyro Helicopter, which in fact is the one I have, since it is a robust helicopter I can mount a Go Pro camera to it and I have better images; of course that is not as cheap as 70 USD but hey, if I want to have something good I have to pay the price for it, Golden Rule! Thanks for Sharing, I'd have liked to participate in the Give away, too late I guess. YEAH I HAVE THIS ONE.... AND IT SEEMS TO HAVE AN ISSUE ON TURNING R OR L .. IT ALSO DOES NOT FLY FORWARD VERY WELL ....THE CAMERA WORKS AWESOME...BUT THE OTHER ISSUES SEEM TO PUT IT ON THE SHELF ....ANY IDEAS ON WHAT IS UP WITH IT WOULD BE REALLY APPRECIATED ????? Be fun to play with. "it was most probably written and printed in China and therefore extremely confusing"
I have been looking at one of these, thanks for the review. The heli design is really elaborate, a shame that it got a transmitter of poor quality. Once I got a working transmitter on eBay, the sudden drops stopped and this buddy flies like a dream. Another important point in the manual sez: After flying, let the LiPo battery cool down first, before recharging. - Don't you ever forget to turn off the video camera by remote control BEFORE turning of the helicopter power switch. If you forget to do so, the video you just grabbed will be empty (you get a file with zero KB in length) and that last kamikaze mission (where you spectacularly wrecked the heli) is lost. -- Landing gear: When doing a violent landing, this likes to break off close to the helicopter base. Stick on those skid rubbers! -- Rotor blades (who would have guessed…) Rather make a bail out drop than hitting something with these. I actually managed to buy replacement rotor blades for a completely different heli model and "dremel out" the differences. - You can get replacement parts nearly only on eBay. yeah, I agree... this is probably a helicopter for indoors use or only on really calm days. But it is cheap and a good learner model. I found a place in australia that sells all of the replacement parts for this helicopter. Unfortunately if you live in the US, then your shipping will be higher than the total cost of parts. These parts are actually pretty cheap. So, if you need a lot of parts (I'd suggest making a list of parts that you expect to need in the future) then place an order with http://www.totallycontrolled.com.au/ and pay the confiscatory shipping fees. wow.....my son sure like it!! Nice resolution on the camera for something so small. It would be so cool to win this. I am a 63 year old kid. I have always enjoyed different things and new toys, but never had one of these. I outgrew my rc car. Hope to have a new toy to play with. Keep it going makeuseof. hope i win it... thanks for so many awesome giveaways MakeUseOf! Very cool give away. I am hoping to win as I can visualize incorporation of the photos from this machine into my real estate exterior photography business. It would add a new dimension to my work (and be fun too). I would have so much fun with this I might have to quit my day job! Great product and great giveaway! thank you for this nice contest and chance! Regards. I just entered! Thanks a lot guys! Since the last one and half year, I have been working out to build up a remote control helicopter at my home in my free times and I have got ready with the helicopter model and I have left with the inside parts. I always had a dream to have a remote control helicopter but its just much expensive in the market to have a toy for Rs 4000 (75$) and so I didn't have it yet. I have always been dreaming of a model as shown in the Bollywood movie '3-idiots'.... And I surely will make it in near future.... If I win it here, I won't stop working on it for sure!!!! Cool device for recording far . nice giveaway...perfect for my niece a birthday gift.thaks. Am I right to assume you will contact me by email to get my address so you can deliver the Hawk to me. P.S. It's the UK so I don't think you'll be able to fly it here. That is my favorite favourite. Please count me in. I am really excited. Wow this is just too coool. Man what am I looking at. And MakeUseOf your getting to awesome with these Givea-ways. This is a ver good selection.